I’m always amazed at how many people don’t like to refer to what they do as ‘selling’. Let’s take a look at the official definition of the word: To transfer (goods) to or render (services) for another in exchange for money. So really, ‘selling’ is just the process of collecting money for what you do. So why does the word turn so many people off? Chances are it’s the thought of being labelled a ‘salesperson’ that makes people nervous. Sure, Elmer Wheeler taught businesses to ‘Sell the Sizzle’ in the 1930’s, and Alec Baldwin went on his classic ‘Always Be Closing’ tirade in the 1980’s movie, Glengarry Glen Ross – but those days are long gone. No one wants to be ‘closed’ anymore. Instead, they want to be consulted, advised, and helped in making a decision that is best for them. Or would you be surprised to read that 65% of new business comes from referrals New York Times and that people referred by friends are 4 times more likely to buy Nielsen and will spend 16% more Wharton School of Business? With sites like Google, Facebook and Yelp, today’s consumers practically walk themselves through the sale by the time they get to you– and all you have to do is make sure you don’t muck it up by saying the wrong things when they contact you! That is why I like to call this the Golden Age of Selling. At no other point in history have you had it so easy. The 20th Century was about convincing people to look at you; whereas the 21st Century is about what happens when they find you on their own. 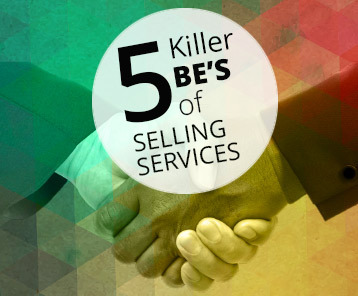 To make it easy to convert prospects in today’s ‘everything about you is available online’ world, I put together these 5 Killer Be’s of Selling Services. As long as you follow this simple process when talking to your callers, you’re sure to have them raving about your phone skills and booking appointments, spending money, and telling others to do the same! Nearly ⅔ of Americans now own a smartphone (Pew Research Center). That means people are calling you at all hours of the day because doing so is as simple as pressing a little blue button from their mobile device. As a result, 67% of people have reported that they have subsequently hung up the phone out of frustration they could not talk to a real person (American Express). These are problems all businesses face. Therefore, pay someone to answer your phones all day, every day. If you need help with that, contact YesTrak – we’d love to take your calls when you can’t get to them! Since callers know all about you before they call, your #1 job is to help them– not to close them. Start by collecting a name and phone number (in case you get disconnected), and then quickly ask the primary reason for the call. The sooner you get to the real reason the caller is contacting you, the sooner you will be able to help them (and your pricing will become less significant). Don’t forget to express empathy for the caller’s problems (assuming they have problems). Empathy allows you to connect with people, and demonstrates that you are focused on helping– which is exactly what your callers want you to be focused on. It seems simple, but it’s amazing how many people are just not polite when answering phones. ‘Please’, ‘Thank you’, ‘May I’, etc, they are words that are so important in your calls and demonstrate the level of service your callers can expect once they engage. And don’t forget to use the caller’s first name as often as possible. People love to hear their name, so take advantage of that to make them feel special. Also, smile while you’re on the phone (and watch yourself smile in a mirror if you can). Your tone is so much warmer when you’re smiling. How can you expect people to be excited about what you do if you aren’t excited when you’re talking to them? Energy is contagious, so spread it across your telephone wires. Enthusiasm comes from loving what you do, believing 100% in what you sell, and being very knowledgeable about your products and services. So use your own services as often as possible so that you can put yourself in the caller’s shoes as questions arise. Confidence in your ability to answer questions is critical in today’s selling environment. Challenge yourself to be good every single day. It takes 12 positive experiences to make up for one unresolved negative experience (Ruby Newell-Legner). So avoid mistakes by staying focused on helping people. As Bruce Springstein once said about his ability to continually grow his fan base, “Sustaining an audience is hard. It demands a consistency of thought, of purpose, and of action over a long period of time.” The best businesses in the world give you a 5-star performance each and every time they interact with you– so strive to do the same in your business and you will never have to worry about getting more referrals again!